Beat the heat this summer and quench your thirst with this super refreshing Cucumber Melon Sangria. The best summer cocktails are light, refreshing and easy to sip on all night long. 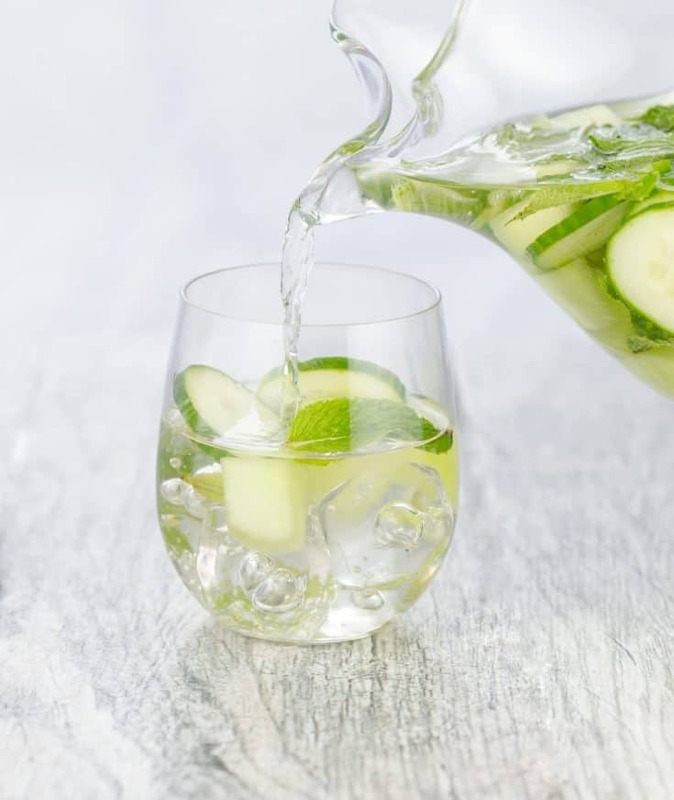 This Cucumber Melon Sangria ticks all of those boxes plus it is made in advance which pretty much makes this the perfect summer party cocktail. Sangria is a cocktail that originates in Spain. The most readily known version uses red wine along with a variety of fruits and another form of liquor like brandy. This Cucumber Melon Sangria is different in that it uses white wine instead of red and gin instead of brandy. What white wine do I use to make a white sangria recipe? What I love about sangria is you don’t have to break the bank to enjoy it. A $10 or less bottle of white wine will do the job nicely. Pick a moderately dry white wine for this Cucumber Melon Sangria rather than a super rich-tasting wine simply because you want the flavors of the fruit to shine through. Pile in chunks of sweet honeydew melon, fresh cucumber slices and a handful of cooling mint along with a generous pour of dry gin. Let this mixture chill out in the fridge for at least a few hours so all the flavors blend together. To keep the taste light and refreshing, add a bit of sparkling water or club soda to the pitcher just before serving. Tip: Not a honeydew fan? Try substituting cantaloupe instead! 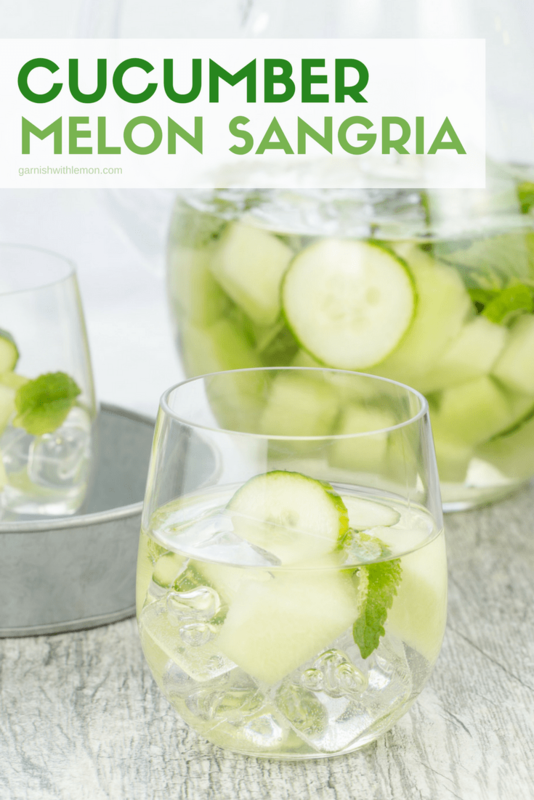 The recipe for this Cucumber Melon Sangria is easily multiplied for a large group of people, and I highly recommended that you at least double it. 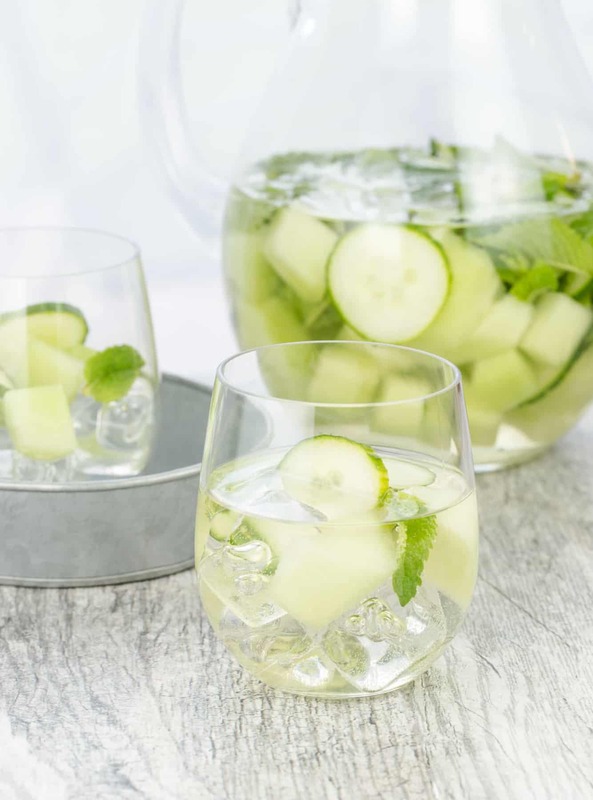 The sweet flavor of the melon chunks, the crisp taste of the cucumber slices and and the refreshing mint leaves all combine to make this white sangria recipe a huge crowd-pleaser. You’ll be amazed at how quickly you sip your way through it. You can never have too many white sangria recipes! Combine all ingredients except sparkling water in a large pitcher and still well. Refrigerate at least 3 hours (more if possible). Just before serving, pour in sparkling water and gently stir to combine. Serve over ice. Hi Jacque, I’ve never tried it with vodka, but it’s a pretty forgiving recipe. Would love for you to give it a go and let us know how it turns out! I am not a fan of gin. Mediciney flavor. Have you tried it with wine only? Hi Karen, I have not tried it without the gin, but you certainly could give it a go. Alternately, you could try swapping the gin for vodka. (Another reader suggested that for folks who don’t enjoy gin.) Happy experimenting! Modification : I “thought” I had club soda on hand, so when making it I decided to use ginger beer that I did have (carbonated with citrus & ginger), so I omitted the sugar…plus my honey dew was really sweet. I placed small plastic appetizer forks on the rim of the glass, so the fruit/cucumber could be easily eaten out of the glass. We all commented on the fruit being so alcohol-infused…”boozy” as one labeled it. It made for a very good time !!!! Hi Sandy, So glad you enjoyed it! And I love your adaptation. Cheers to more summer parties! Love this drink! It’s light and refreshing. Perfect drink for relaxing on the deck. Agreed, Erika! Cools you right off after a hot summer day. I am going to try this with cucumber vodka ! I did use the gin, made it exactly as shown, for a dinner party of 12. Everybody loved it, including me! Thanks for the great idea. Yay! So glad everyone enjoyed it! Looks great! Can this be made a few days prior to drinking like a typical sangria or will the ingredients not sit well? Hi Jen, I wouldn’t make it more than a day in advance as the alcohol will start to break down the melon and cucumber. That is more of a personal preference though, as I enjoy eating those “drunken” pieces straight from the glass. Enjoy! HONEY DEW MELONS. CAN I USE WATER MELONS INSTEAD. I’d definitely give it a try, Helena. Stop back and let us know how it turns out! Loved this sangria! Sangria is usually way, way too sweet for me, but this was so light and refreshing. I found a bag of frozen honeydew and cantaloupe balls, so that cut out 90% of the prep time. I would definitely make this again! Love the frozen fruit shortcut!